Mrs. 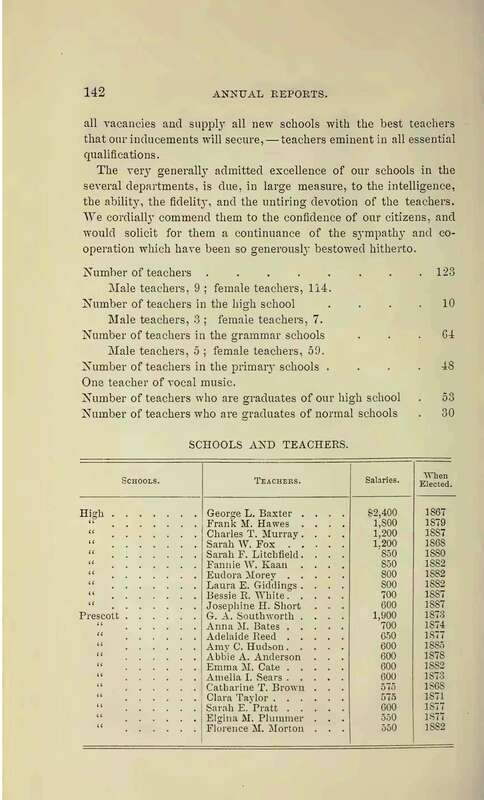 Prince was educated in our public schools, and was graduated at the high school with the class of 1865. For ten years, and until within a few weeks of the time of death, she was [a] teacher of the Union primary school. She was tender and watchful of her pupils, earnest in her efforts for their improvement, and faithful in the performance of every day. 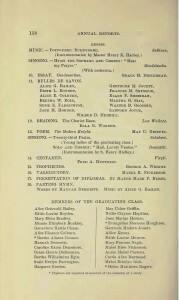 The annual report also includes information about the high school graduation ceremony, which took place on 28 June 1887. 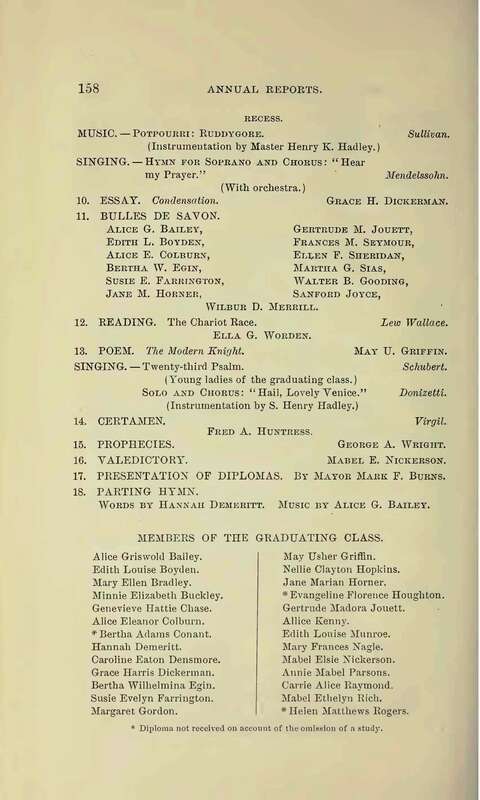 The names of the graduates are listed in this report, as well as those students who sang and read poems during the ceremony. In addition to information about municipal employees, these annual reports contain details about a town or city’s residents that can be useful for your genealogical research. The Seventh Annual Report of the Receipts and Expenditures of the City of Auburn (Maine) for the Fiscal Year Ending February 29, 1876, provides a list of individuals who sold supplies to the city for various projects, such as lumber for carpentry work at the city’s poor farm. Many of these annual reports, such as Mayor’s Address and Annual Reports of the City of Rockland (Maine) for the Year Ending March 1877, include information provided by the local police and fire departments. In this volume, the chief of Rockland’s fire department submitted a table titled “Records of Fires and Alarms from March 1876 to March 1877.” It includes the date of the fire or alarm, the street where the incident took place, the names of the owner and occupiers of the home or building, the cause of the fire, and the cost of the damage to the structure. If you are trying to learn why your ancestor changed occupations or moved out of a particular community, information such as these fire department reports may contain the answers you are looking for, by showing that their business or home was destroyed by fire. Even if you do not locate your ancestor’s name in these reports, you may still find information that will help you learn more about the community where your ancestor resided. Many of these annual reports contain statistics provided by the local board of health or city physician listing the causes of death of those who died over the course of the year. Although the names of the deceased are not listed, if your ancestor died of a particular disease during this time period, you may discover that his or her death was caused by an outbreak of contagion. These reports are available at a number of local libraries and archives. 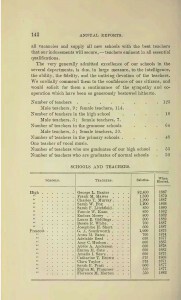 For Massachusetts, the State Library of Massachusetts has a number of reports in their collection. A list of these reports is available here. Some digitized copies are available online at websites such as Archive.org and Google Books. Select reports for the state of Maine are available online through the University of Maine’s Raymond H. Folger Library. A number of New Hampshire town and city reports have been digitized as well, and can be found online through the University of New Hampshire Library’s website. Even if you do not find information on your ancestor in these reports, reviewing these documents can help you learn more about the community where he or she resided. City of Somerville (Massachusetts) Annual Reports, 1887 (Boston: Rand Avery Printers, 1888). Seventh Annual Report of the Receipts and Expenditures of the City of Auburn (Maine) for the Fiscal Year Ending February 29, 1876 (Lewiston, Me. : Printed at the Journal Office, 1876). Mayor’s Address and Annual Reports of the City of Rockland (Maine) for the Year Ending March 1877 (Rockland, Me. : Printed at the Courier Office, 1877), p. 41. I found some county annual financial reports in the Northern New York newspapers digitization project. Including collateral ancestors I compiled an Excel spreadsheet of the ancestor, type of work, location, date and amount paid, along with source data. Putting all the information in one place yielded a highly informative overview of their lifestyle in the late 19th century for rural people who were not otherwise well known. Our town fiscal report, typical of New England, also includes lists of moneys owed the town, by address, responsible person, amount and what for (and for how long). Property taxes, utility charges, etc. Makes for interesting reading, but even more so, since these reports go back quite a ways and could yield information about the circumstances of, if not an ancestor, then the neighborhood and the town itself. More light on the circumstances in which they lived. I hadn’t thought of that. Thanks for the reminder.